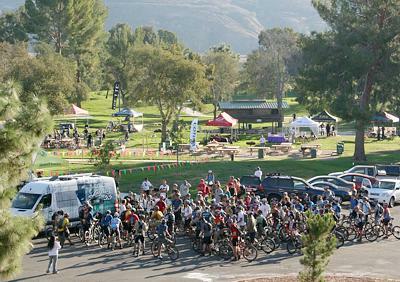 Riders gather for the Advanced Guided Ride with guest pros Brian Lopes, Ned Overend and Sid Taberlay at the 2009 Fat Tire Fest held October 25th at Castaic Lake. The Terra Times moves from print to the online eTerraTimes! Volume 17, #2 of the Terra Times, mailed to CORBA members several weeks ago, was the last printed edition. After much discussion and soul-searching, we have decided to rename the eNews to the eTerraTimes and distribute news to our members and other interested parties electronically. The eTerraTimes is normally sent out the Thursday preceding the first Saturday of every month, as was the eNews. Electronic distribution is more timely. The lead time for the printed Terra Times was months, so we were not able to include recent developments. The lead time for electronic distribution is only hours. CORBA would like to take this opportunity to thank the many volunteers who contributed to the Terra Times over the years, especially Jim Shanman of Asylum Design who designed each edition, David Ross who was the editor, and Ross Lombard of Lombard Graphics who printed each edition at no charge to CORBA. 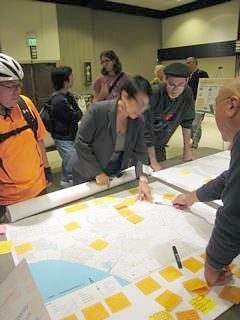 The draft Los Angeles City Bike Plan was recently released and mountain bicyclists should be concerned with the direction it has taken. We need comments not only from L.A.-based riders, but from anyone who has positive stories about relationships with equestrians and other trail users on California trails. Public comments can be submitted online or via postal mail. The comment period has been extended to January 8, 2010. Somewhere in L.A. City Parks there should be opportunities for mountain bicyclists -- it's bad public policy that all dirt roads and trails are closed to bikes. Bicycling is a positive, safe, health-promoting activity for people of all ages and should be encouraged with both natural-surface and paved riding opportunities. The 2009 plan should incorporate the 1996 bicycle plan language that called for pilot projects and a gradual increase in mountain bike opportunities in the parks. Bicyclists safely share trails with other trail users, including equestrians, all around the globe. Mountain biking is a sustainable, manageable appropriate activity for L.A. parks -- it works in dozens of other cities so why not ours? For several years, anti-bike groups have mobilized to perpetuate the bicycle ban in LA City Parks. An older 1996 bike plan proposed a gradual increase in mountain bike opportunities, but they were never enacted. The new plan abandons those proposals and focuses instead on studies and research. We have published an analysis of the plan. At public meetings related to the plan, anti-bike equestrians have testified that bikes and horses simply don't mix and that even separate trails for bikes and horses won't work because bicyclists won't follow rules. Most of the opposition has been from equestrians who ride in Griffith Park, many from the nearby cities of Glendale and Burbank. Griffith would be a great place to bike, especially for locals, but bicycle advocates have not asked for Griffith specifically. We've asked for some trails somewhere, but the anti-bike groups' response has essentially been, "No, nowhere, never." The day of the 22nd annual Fat Tire Fest was a beautiful sunny one in Castaic with over 500 people attending the event and the highest number of participating exhibitors ever! CORBA was proud to have supporting the fundraiser, legendary mountain bike super stars Brian Lopes, Ned Overend and Sid Taberlay who attracted a big crowd for the advanced ride and demoed their techniques in Mark Langton's skills clinic. Our three special guest pros were also accompanied by the Subaru Gary Fisher Regional Team and three riders from SoCal Interscholastic Cycling League. There were plenty of smiles all around as participants enjoyed the Bike Warrior Wheelie Contest, watched as adults and kids alike tried the bike limbo, cheered on the cycling fashions of Girl Meets Bike, huffed and puffed up West Ridge Trail in the Cynergy Hill Climb Contest, munched Carmen's delicious tacos as children rode their bikes continuously throughout the day in the Kids Fun Zone and the "big kids" did likewise in the Skills Features area. Demo bikes were out on the trails all day long keeping the bike manufacturers Giant, Specialized, Cannondale, Trek, Scott and Ibis very busy! Among the big raffle prizes were a Specialized Rockhopper Expert 29er, light systems from Light and Motion, carbon frame from Sette, Simple Seven cruisers from Giant and an urban bike from Cannondale. Good fun was had by all ages and riders! Thanks to all the FTF volunteers, sponsors, special guests and supporters who made this 2009 Fest a very special day and successful fundraiser! 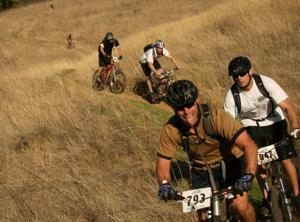 The Fat Tire Fest was written up in MountainBike Action and the Los Angeles Times! View the 2009 Fat Tire Fest photo galleries. About 160 volunteers built a new trail in Newbury Park on October 17th. The trail connects from Mountain Creek Drive to the Potrero Ridge Trail. Except for about 20 feet of a very difficult section, the entire trail was completed in one morning. We have a photo gallery of the work, plus a write-up from the Ventura County Star. California State Parks announced on October 27th that park districts across the state have finalized their Service Reduction Plans. While some service reductions began taking place shortly after the state budget was passed, the larger, more noticeable changes that include changes to park hours of operation were scheduled to be implemented on November 1. The Service Reductions are one part of the $14.2 million, one-time budget savings plan Governor Arnold Schwarzenegger announced on September 25 to keep parks open with the least disruption to visitors. Melanie Beck, outdoor recreation planner for the Santa Monica Mountains National Recreation Area, says there are only three gaps in the Backbone Trail, and the National Park Service is confident that the entire route can be completed in two years time. For the complete story, see the article "Backbone Trail Captures the Essence of the Santa Monicas" in the Malibu Surfside News. As a result of the Station Fire last month, a huge area of the forest has been closed to allow for it's recovery and for public safety. The area will be closed until the end of September 2010. The Forest Service provides a description and map of the closed area which should be consulted before venturing into the area. All trails and roads within the closed area are off limits to the public until the end of September 2010. Mountains Restoration Trust (MRT) staff and volunteers are busily preparing for a fall fundraising program to support the acquisition of 78 acres of ecologically sensitive land to be added to the Cold Creek Preserve near Stunt Road in Calabasas. The recent fires served as an urgent reminder of the timely and significant mission of the Trust to preserve and enhance the natural values of the Santa Monica Mountains. The fundraising event gets underway at 6:00 p.m. on November 12th with a silent auction, and no-host bar cocktail reception with hors d’oeuvres that will allow participants to catch up with MRT staff on current programs and learn more about the significance of the 78-acre Sisson acquisition before the main program with featured speaker, internationally acclaimed scientist, Jared Diamond, Ph.D.
Dr. Diamond is Professor of Geography at UCLA and the author of 8 books; among them, “Guns, Germs and Steel: The Fate of Human Societies,” which garnered him a Pulitzer Prize, and was made into a multi-part series on PBS. His most recent book, “Collapse: How Societies Choose to Succeed or Fail,” was a New York Times Notable Book. Dr. Diamond holds a B.A. from Harvard and a PhD from Cambridge and has received numerous awards including the National Medal of Science and the Japanese International Cosmos Prize. Attending the fundraiser supports MRT’s acquisition of the 78-acre property as well as its on-going work to acquire other properties in the Cold Creek watershed which together will create a nature preserve that includes a year-round stream and core habitat for wildlife, while adding a scenic trail for human enjoyment. 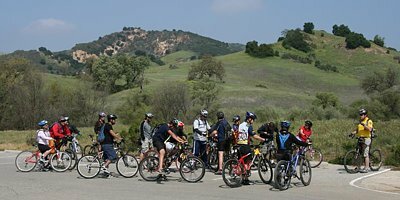 The trail corridor is a 1.6-mile link in the 17-mile Calabasas/Cold Creek Trail and will offer another venue for passive recreation through a scenic corridor. After the land is acquired, visitors will be able to enjoy a riparian forest with a waterfall, dense chaparral with sandstone outcrops and hillsides of coastal sage scrub, and be a witness to why the Cold Creek watershed is recognized for its biological diversity. This 78-acre upland habitat with two small perennial streams that are vital to the health of the riparian downstream ecosystem that supports the perennial waters of Cold Creek. Additionally, this east-to-west wildlife corridor links state and national park lands and will be protected in perpetuity. For more information and to purchase tickets (please purchase by November 9th) visit the MRT website. Jo Kitz, the Co-Executive Director of MRT, tells us that these trails will be open to mountain biking once their acquisitions and trail improvements are complete. Back by popular demand, NCM Fathom and Citizen Pictures brings Race Across the Sky – Leadville Trail 100 Encore Event back to select movie theatres nationwide for ONLY ONE NIGHT on Thursday, November 12th at 8:00 pm PST. Tickets on-sale Friday, November 6th! Visit FathomEvents.com to sign up for an email reminder, find a participating theatre and to purchase tickets on 11/6/09. Advance purchase for this one night event is strongly encouraged, as the original October event sold out in select theatres nationwide. In addition to the presentation of the documentary Race Across the Sky – Leadville Trail 100, this event includes a candid panel conversation with Lance Armstrong, Dave Wiens (6x Leadville 100 winner), Travis Brown (Olympian and professional mountain biker), Matt Shriver (Ft. Lewis College Mountain Biking Coach, coach of 4 consecutive mountain biking national championships) and Ken Chlouber (Leadville Trail 100 Founder). At 12,570 feet anything can happen…so don’t miss your last chance to see what does in this one night event in select movie theatres nationwide. Please go to http://www.ncm.com/fathom/Sports/RaceAcrossTheSkyENC.aspx to see which theaters in your area are showing Race Across the Sky – Leadville Trail 100 and to purchase tickets. Saturday November 7th is the next skills clinic.